“Brigadier V.R.I. Doyle, brother of Richard (Dicky) Doyle, the well known Victorian illustrator and cartoonist believed the Irish history could not be celebrated until the Act of Union of 1801 was repealed….Doyle may have been right. Certainly the experience of R.G. Kelly, an Irish artist who exhibited a painting of an eviction scene at the British Institution in 1853 would seem to bear this out. Strickland, in his Dictionary of Irish Artists, records that the painting, ‘An Ejectment in Ireland’ or ‘A Tear And a Prayer for Erin’ was ‘much criticized as a political picture, which the artist never intended, and was actually discussed in the House of Commons.’ Kelly got the message and appears to have avoided such subjects for the remainder of his career. 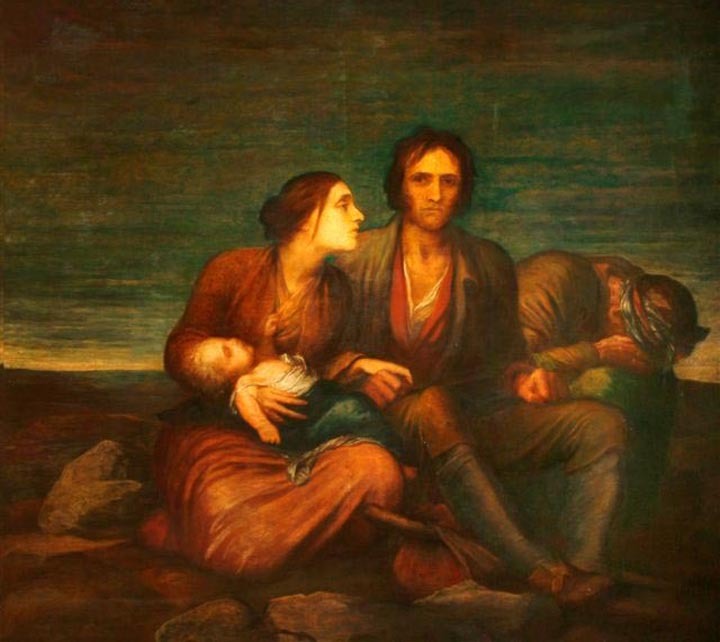 Catherine Marshall, “Painting Irish History: The Famine,” History Ireland, vol. 4, no. 3 (Autumn 1996): 47, 48-9. John Turpin, “Irish History Painting,” The GPA Irish Arts Review Yearbook (1989-1990): 241.